Those of us who’ve been using MS Outlook for several years or more have by now likely amassed a rather sizable and deep hierarchy of private folders. Contained in a .PST file, these folders aren’t searchable by name, as Outlook doesn’t offer such a facility as part of its mechanism that lets you search for filed emails. 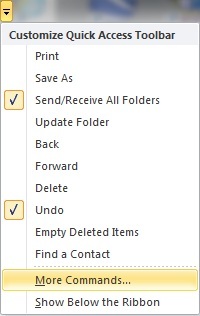 While you can search for emails based on a variety of criteria, if any of those items returned as a result of an Advanced Find operation is in a deeply nested folder, you’re then stuck with the task of figuring out where in your folder hierarchy to dig in order to find that sub-folder. Fortunately, this limitation can be circumvented by running a VB (Visual Basic) Office macro, available through the “VBOffice” web site. 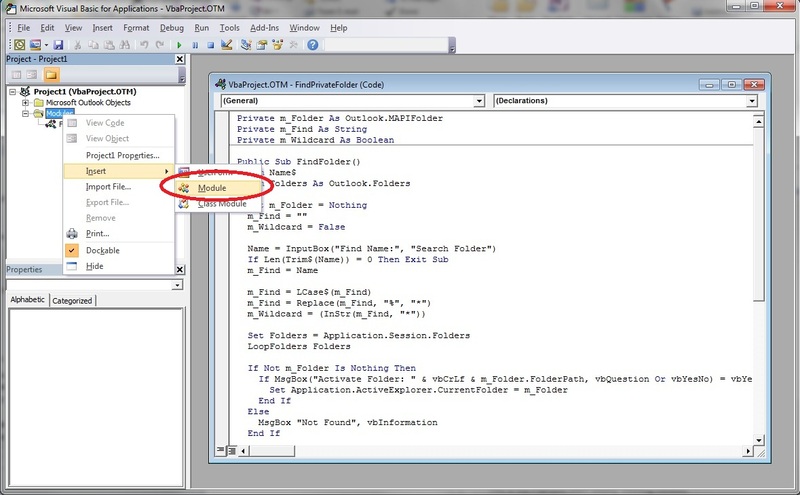 Prepared by a fellow named Michael Bauer back in 2010, this macro contains all the code Outlook needs in order to display an elegantly simple search dialog where you specify a searched-for folder name. For those familiar with MS Office automation and development, simply copy the code into a module, assign the module a logical name, and once you’re back in the main Outlook UI, run the macro. The procedure below is written for those interested in becoming more familiar with Office automation. Following these steps will enable you to save this macro to Outlook, and run it at will. 1. Hold down the Alt key and press F11 to open the VGA development window. 2. In the Project pane (in upper-left portion of the UI), select Module > right click > Insert > Module. 3. In the VbaProject.OTM pane (toward center-screen), copy over the code from the link above. 4. In the Properties pane (in lower-left portion of the UI), rename the module, e.g. 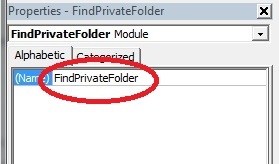 FindPrivateFolder. 5. Toggle back to the main Outlook UI and click the Customer Quick Access Toolbar menu. 6. 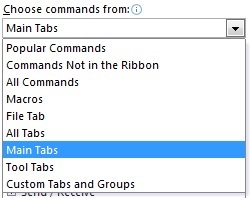 Choose More Commands > Customize Ribbon. 7. 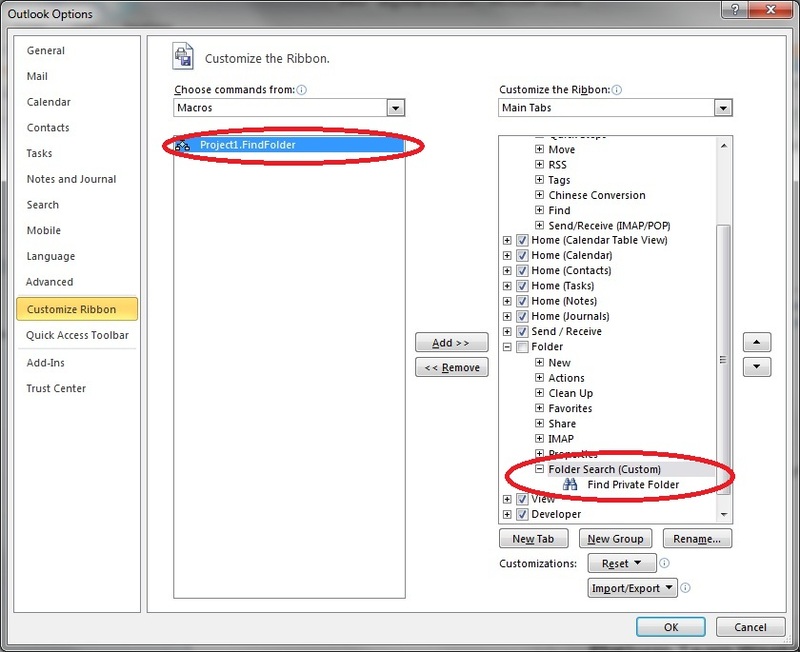 Under Customize the Ribbon: Main Tabs, select the Developer checkbox and click OK.
8. In the Developer tab, click Code > Macros, and run the macro you just created by selecting it. 9. 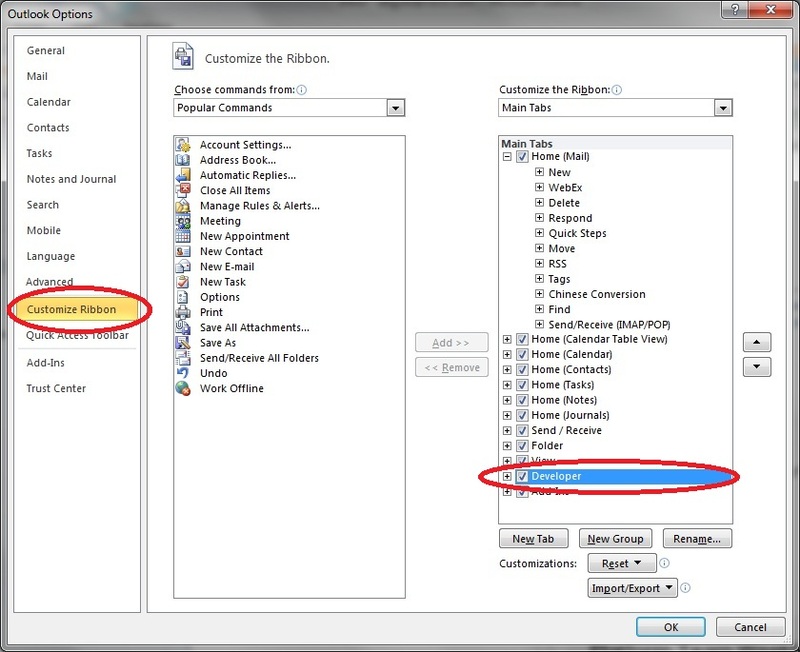 In Outlook Options, select the Customize Ribbon > Choose Commands from: Macros. 10. 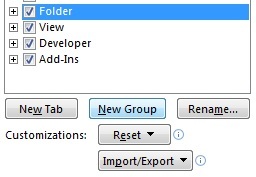 Under Customize the Ribbon: Main Tabs, choose Folder > New Group. 11. Name the command, e.g. Folder Search. 12. Click Add to attach the macro to the newly created group, and click OK.
13. Rename the command, i.e. to make it shorter and more intuitive; and if you wish, associate it with an icon. I recently started getting popup ads with ridiculous frequency, like at least a dozen per hour (and that was a minimum), non-stop, as long as my Chrome browser was open (I’m running Windows 7, Chrome version 24.0.131257m). This was despite having my browser settings defined to block all popups. To make matters even more irritating, in addition to these ads being repetitive and constant, they weren’t even interesting, focusing mainly on things like weight loss, face lifts, and how to make lots of money surfing the Internet (yeah, right). Getting back to business, after ruling out a virus (see news and discussion about Adserv virus), I went ahead and confirmed that my browser was indeed set to block popups. This led me on a fruitless and frustrating course of checking, rechecking, and making all manner of adjustments to my Chrome popup settings, an annoying mini-project that played out over the better part of a week. Finally, I’d more or less given up, resigned to either re-installing Chrome, or limiting its use. However, before taking that step, I decided to do a search on what seemed to be the name of one of the companies putting out these ads. To my luck, I came across a Google Group, of all places, hosting a discussion describing the (pretty simple) solution. The online discussion I came across suggested that “Insta” extensions—such as InstaTwitter, InstaTumblr, etc—in Chrome were the actual culprits. Why this is an issue in Chrome and not in Firefox or IE isn’t clear, though indeed, it seems to be a known problem. So in my case, the solution was to disable InstaTwitter. Though I’ll provide, in addition to the (simple) solution that worked, the procedures that didn’t work; this might be useful for conveying the overall discovery process, which included some dead-end steps. 1. Performing steps #1 – #5, as above. 3. Select InstaTwitter (or any other “Insta” processes like InstaTumblr, etc). You may have to repeat the procedure for subsequent reboots or new log-ins to your PC. Or perhaps you could disable the Insta processes permanently. I was recently looking around the Internet for a solution to the Lenovo X200 standby / resume (hibernate / wake-up) issue, which has gotten really annoying lately. Basically, the problem is that in about 15%-20% of cases, when placing the machine in standby or when trying to wake it up standby mode, it black screens. I came across a bulletin board that recommended disabling the fingerprint scanner via the LT’s BIOS, although no instructions were provided on the site (and thus, no link). 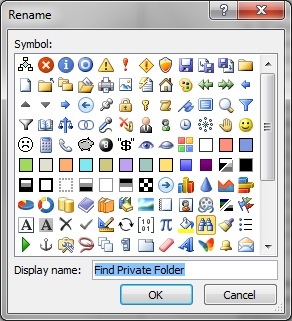 In Windows (I’m working in WinXP), select the My Computer icon. In the pop-up menu, choose Properties. In the System Properties dialog, select the Hardware tab. In the main tree, open the Biometric branch. Once you’ve opened the branch, you should see an item marked AuthenTec Inc.; select it. In the pop-up menu, choose Disable. Note that there might be a more recently released driver that solves the black-screen problem. In that case, instead of disabling it, perhaps updating to the newer driver would solve the black-screen problem without requiring a disable.